Alexander Massialas earned a sixth-place finish in Anaheim. Photo Credit: Augusto Bizzi. 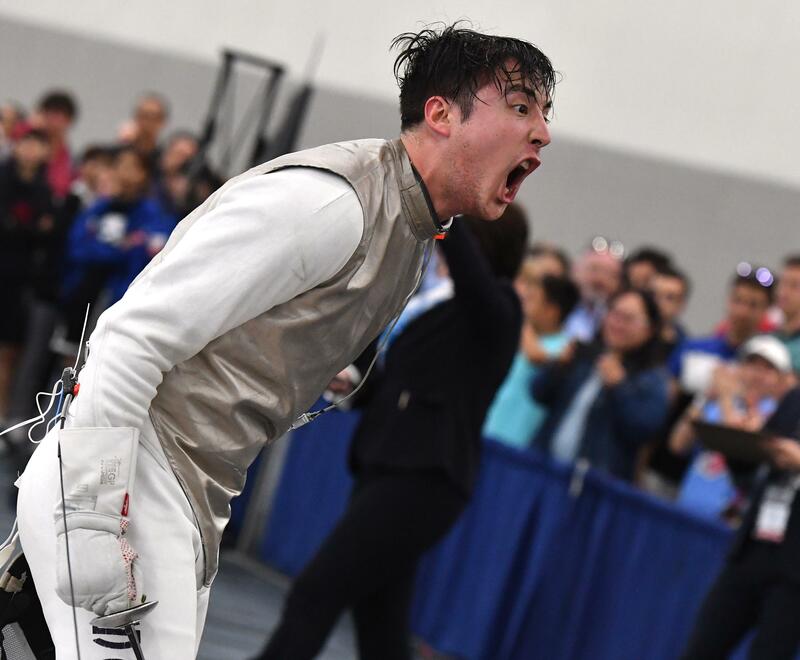 (Colorado Springs, Colo.) – Fencing in his home state, 2016 Olympic silver medalist Alex Massialas (San Francisco, Calif.) earned a top-eight finish at the Absolute Fencing Gear FIE Grand Prix Anaheim. Massialas went 3-1 on the day and secured his third top-eight result of the season after taking bronze at the Cairo World Cup earlier this month. Massialas started his day with a 15-8 victory over Daniel Dosa (HUN), ending the bout on a 9-2 run. In the 32, the 2016 Olympic team bronze medalist got off to a quick 10-2 start against two-time Junior European Championship medalist Wallerand Roger (FRA) and went on to win, 15-7. Facing World No. 6 and 2012 Olympic Team Champion Giorgio Avola (ITA), Massialas found himself at a 6-3 deficit early, but scored straight six touches to take a 9-6 advantage. Avola came back to tie the score at 11, but Massialas pulled away for an 15-12 victory, using the energy of fencing in front of a home crowd to help fuel him. One win away from a medal, Massialas fell into a 7-1 hole against 18-year-old Tommaso Marini (ITA) and couldn’t recover, dropping the bout, 15-9. The 2018 Junior World silver medalist went on to upset 2018 Senior World Champion Alessio Foconi (ITA), 15-9, in the semfinals to earn his first Grand Prix medal with a silver. Massialas’ club teammate who was also a member on the 2016 bronze medal winning team, Gerek Meinhardt (San Francisco, Calif.), claimed a top-16 finish in Anaheim. Looking for his second Grand Prix medal of the season, Meinhardt came out hot in the 64, taking a 7-0 lead over Thomas Lerche Berg (DEN) and not letting up for a 15-4 victory. Tied at seven with Pierre Loisel (FRA) in the 32, Meinhardt scored four straight and went on to a 15-10 win. In the table of 16, Meinhardt fenced Ka Long Cheung (HKG), who he lost to in the semifinals at the Torino Grand Prix. Down 13-11, Meinhardt responded to take a 14-13 lead, but couldn’t hold on and lost, 15-14. Cheung went on to win bronze. Entering the competition at No 1 in the world, Imboden was looking to repeat after winning gold at this event last year. He bested 2018 Junior European Championship silver medalist Davide Filippi (ITA) in the opening round before being upset by his teammate, 2017 Junior World bronze medalist Guillaume Bianchi (ITA), by a score of 15-10. The fourth member of the 2016 Olympic team, Miles Chamley-Watson (New York, N.Y.) had high stakes at this event, needing a top-eight to move into fourth in the USA Fencing Senior Men’s Foil Team Point Standings and make his 10th straight Senior World Championship Team where he would compete with Massialas, Imboden and Meinhardt who have mathematically locked their position in the top four through podium finishes on the circuit this season. The 2013 World Champion overcame three-time Junior Asian Championship medalist Yudai Nagano (JPN), 15-11, in the table of 64, which led to a table of 32 matchup with 2004 Olympic Champion Andrea Cassara (ITA). Although Chamley-Watson had won both match-ups this season, Cassara played spoiler for Chamley-Watson on home soil, handing him a 15-5 loss. Notre Dame sophomore Nick Itkin (Los Angeles, Calif.), the reigning Junior World Champion who earned his first Senior World Cup medal of the season in November, will earn the fourth individual position on the 2019 Senior World Team, qualifying for his first senior team alongside Meinhardt, Massialas and Imboden who combine for 24 Senior World Team appearances among them, including the last six straight teams together. Imboden, Meinhardt and Massialas are all among the top 10 fencers in the world holding world rankings of No. 3, No. 6 and No. 10, respectively. The complete Senior World Team for both the foil and epee weapons will be named after the conclusion of the USA Fencing Division I National Championships, April 12-15 in Salt Lake City. Two-time Junior World team medalist Geoffrey Tourette (Cupertino, Calif.) also earned a top-32 finish, his best result since January of 2018. In his first table of 64 appearance on the senior circuit this season, the Harvard sophomore held three-time Asian Championship medalist Ryo Miyake (JPN) to single digits at 15-9. The following round he came within a touch of upsetting Foconi 15-14. The winner of the men’s event was Julien Mertine (FRA), who clinched his first Grand Prix gold by defeating Cheung in the semis, 15-13, and Marini, 15-13, in the final. In the women’s competition, two-time Olympian Lee Kiefer (Lexington, Ky.) and 15-year-old Zander Rhodes (South Orange, N.J.) earned top-32 finishes. At No. 3 in the world, Kiefer defeated 2013 World silver medalist Carolin Golubytskyi (GER), 15-11, in the 64, but lost to three-time European Championship medalist Larisa Korobeynikova (RUS), 15-12, in the next round. Korobeynikova went on to win bronze. Kiefer’s top-32 finish allowed her to retain her world ranking and mathematically secure a position on her 10th straight Senior World Team at just 24 years old. London Olympian Nicole Ross (New York, N.Y.) lost to Leyla Pirieva (RUS) in the 64, but will fence on a ninth straight World Team in Budapest, Hungary in July. Both two-time Olympian Nzingha Prescod (Brooklyn, N.Y.) and five-time Junior World medalist Jackie Dubrovich (Riverdale, N.J.) will compete at Junior Worlds as well with Prescod qualifying for her 10th straight Senior World Team and Dubrovich earning a position on her first senior squad. Competing at her first senior international event, Rhodes posted a 15-12 victory over two-time Olympic medalist Hyunhee Nam (KOR), 15-12, in the 64 before losing to 2009 World silver medalist Hee Sook Jeon (KOR), 15-5. Inna Deriglazova (RUS) defeated teammate Korobeynikova in the semis, 15-7, and narrowly outtouched Alice Volpi (ITA), 15-14, in a battle between World No. 1 versus No. 2, winning her sixth Grand Prix title and second straight at this event.